I absolutely love The Persuaders television series, and for me, Chain Of Events is one of the most enjoyable of the episodes. This one is directed by Peter Hunt, who directed the Bond film On Her Majesty’s Secret Service and the show has a few subtle Bond jokes. It even features the actor George Baker, who played Sir Hillary Bray in OHMSS. The episode opens in Eastern Europe with a plane landing in a clearing. This is part of an M.I.5 operation. The pilot is to receive a briefcase full of important classified documents from a sleeper agent, which he is to bring back to England. But the Communists are onto M.I.5’s little scheme and switch the case for another one. After John Barry’s title theme, which every time I hear it I get goose bumps, we are in a paddock in the English country side. Danny Wilde (Tony Curtis) is camping out. Despite all his millions, he is roughing it. No tent, simply stretched out before an open fire. Then a clock alarm rings. No it’s not a dream. Danny is not dreaming. The alarm is on the other side of the field. The camera pulls back to reveal Lord Brett Sinclair’s (Roger Moore) palatial camping set up. He has a monstrous sized tent, with all mod cons. Attached to the tent is a giant awning which covers his kitchen area, with a refrigerator, a stove, a coffee percolator, the works… Danny refuses to accept Sinclair’s hospitality. If he is camping, he wants to live of his wits. He will only eat what he can catch, and to that end, he grabs a fishing pole and heads off to the river. As Danny marches along, he bumps into Franz Schubert (Peter Vaughan). Schubert mistakes Danny for a man named Baxter. Danny corrects him, and continues on his way. Next Danny sees a blonde lady, Emily (Suzanna Leigh) running through the trees calling Baxter’s name. Confused but unperturbed, Danny continues to the river and then throws in a line. What he hasn’t initially seen, hanging in the tree overhead, is a man in a parachute. Danny helps the man down. He is almost dead, but he has enough strength to unclip the briefcase he was carrying, and clamp the handcuff around Danny’s wrist. Danny now is chained to the briefcase and cannot find the key. Danny wanders off to get help, but in the meantime, M.I.5 have found their courier dead and the briefcase missing. They naturally assume that foreign agent has taken the case, and call all their operatives into the area, with orders to kill. Naturally there actually are foreign agents in the area, and they want the briefcase too. So poor old Danny is everyone’s target, and he’s not too happy about it. 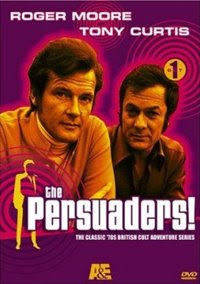 Like most of The Persuaders episodes, apart from the chemistry between Moore and Curtis, the show is buoyed by the great range of character actors, all familiar faces, who fill the support roles. In Chain Of Events we get Peter Vaughan who made a career out of playing slimy villains in many films. Some of his more notable espionage appearances were in The Naked Runner, Philby, Burgess And Maclean, The Macintosh Man, and Hammerhead amongst many others. Suzanna Leigh’s credentials included Subterfuge and Deadlier Than The Male. The Persuaders was a very good series and there weren’t really any dud episodes, so you could pick any of them and be assured of a good time…but this is one of my favourites.